While this is my first time writing for this blog, it’s not my first appearance. I’ve silently sat by while being vilified over the years that this blog has existed. However, there have been some kind words said about me in the past. So when Peter (from here on out known as PP) asked me to guest-write, I jumped at the opportunity. 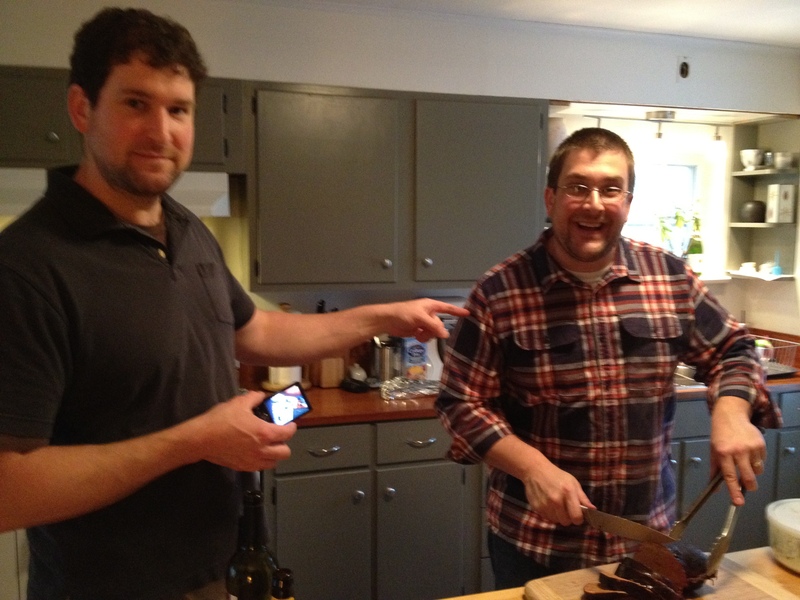 PP and I have learned how to cook together over the years. The main difference between our styles is that he cooks blindly, while I pretty much always cook from a recipe. When we end up in the kitchen together, it frequently escalates to raised voices and dead-arm punches (I deliver them, and I’m not proud of it… he’s just soooo annoying). Many a holiday would have been ruined if we didn’t have such an understanding family. I first learned of PP’s aversion to recipes when I gave him what I thought was the finest Christmas gift ever- the very extensive and very expensive Cook’s Illustrated New Best Recipes… his response was “yeah… I don’t really cook from recipes.” What a gracious gift receiver. 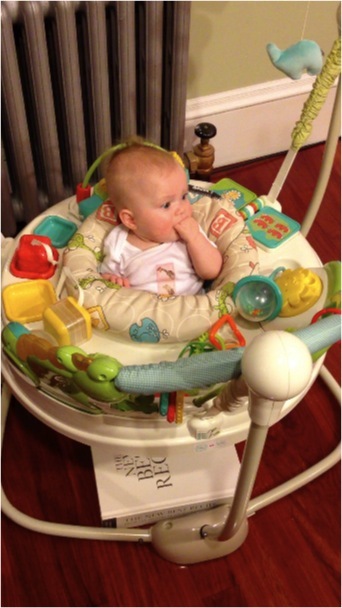 He eventually did use it- for Janet to stand on when she’s in her go-pod. PPnote: Look, I got some good use out of it in this role, learned how to properly debone a leg of lamb from it, and Kristi references it all the time. I ask for driving directions, am terrible at home improvement projects and can’t throw sports balls; can’t we just let my insistence on cooking my way be my tiniest shred of manhood? People tend to assume that since I’m a woodworker, musician, and cook, that I’m creative. Nothing could be further from the truth. I can count the number of original thoughts I’ve had in my life on one hand. So I’m a slave to recipes. The other day I made scrambled eggs with chopped anchovies and parmesan, and actually consulted a cookbook (it was delicious, try it). PPnote: Uncle Timmy shamelessly blaming me for a meal he wanted no co-credit on. He has gotten slimmer. I have not. Jerk. Recently, occasional blog personalities JT and Jill moved into a house that has a wine cellar. Since they aren’t oenophiles (PPnote: nice word choice, nerd), I promptly announced that I would be taking control of said cellar. Cool, dark, temperature and humidity controlled… perfect for curing and salting meats. I had prosciutto and salami on the brain, with no idea where to start. And it appealed to my twisted mindset that the longer it takes to prepare, the more complicated the process is, the more I want to make it. I expect to get a lot of mileage out of this book. Its got everything from pickles to prosciutto. I started with pastrami- I wish I had documented it because it was unbelievably delicious. But I didn’t. 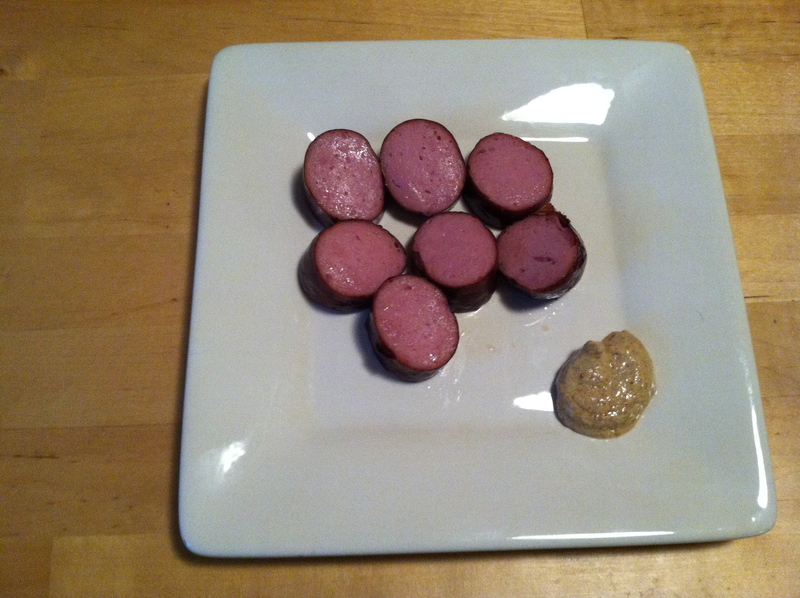 So let’s move on to kielbasa. A little background: Mom Ryan is an excellent cook, but no mother can be expected to crank out a from-scratch dinner seven nights a week. 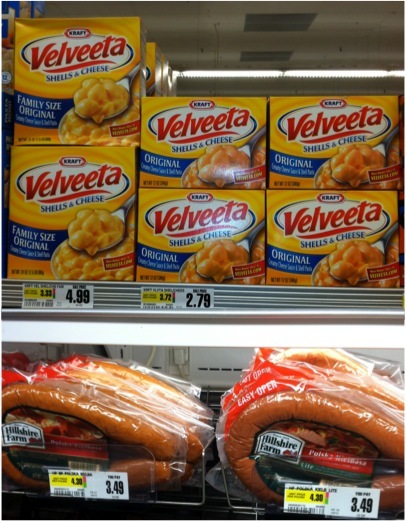 When she didn’t have time or just wasn’t feeling it, she’d turn to the processed food aisle. Fish cakes and spaghetti were one favorite (see January 2011 post); Kielbasa with Mac and Cheese was another… and yes, I capitalized that. Hilshire Farms Kielbasa paired with Velveeta Shells and Cheese is still my ultimate comfort food. It’s an odd pairing, but it works. If I ever kill PP in the kitchen over an argument about how to slice an onion and am on death row, this will be my choice for my last meal. 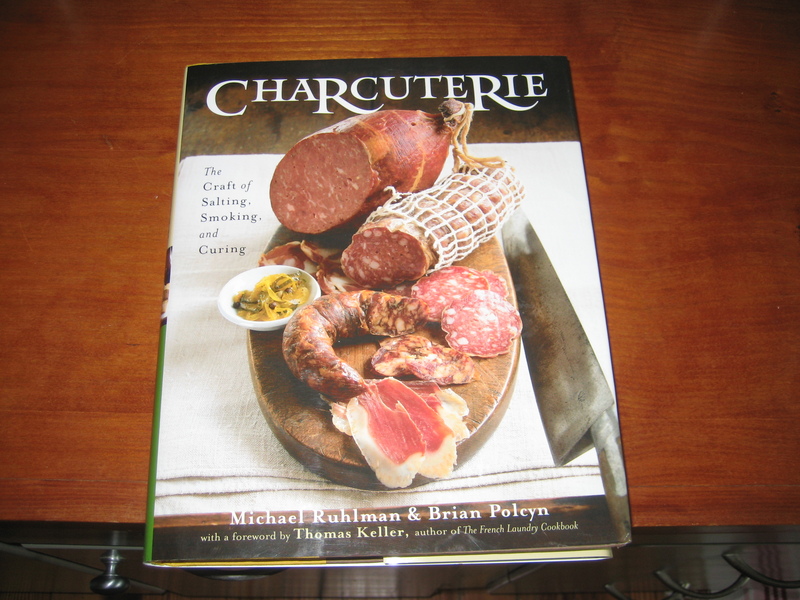 So when I saw a kielbasa recipe in the Charcuterie book, I realized I had to try it. Okay, enough chit-chat. As Walter White would say, “let’s cook”. I’ve made sausage in the past, but had a lot to learn. There are two types of sausage; fresh sausage, which is meat ground with spices and stuffed into casings (like breakfast sausage or Italian sausage), and emulsified sausage, in which the fat and meat are uniformly dispersed in a fine texture (like hot dogs, bratwurst, and- you guessed it- kielbasa). Mayonnaise and hollandaise are also emulsions. I pretty much copied this paragraph from the book. 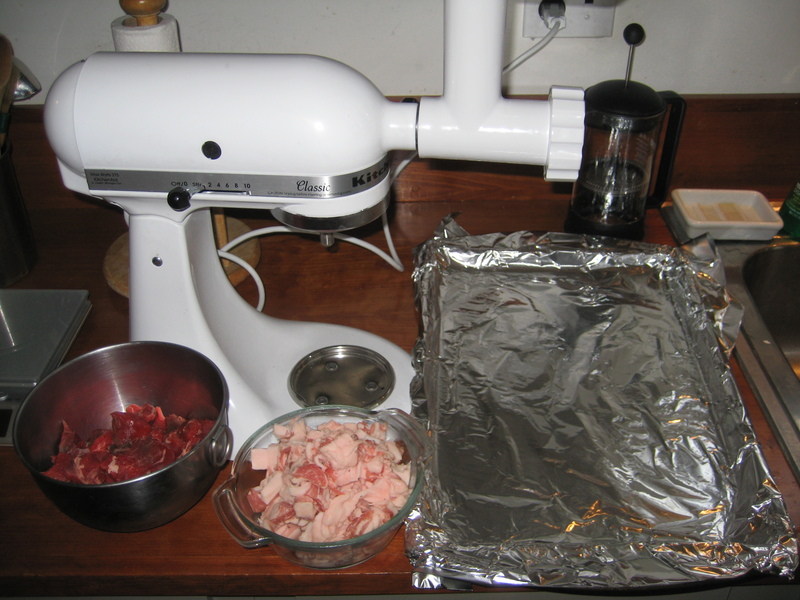 I started by dicing and partially freezing 1 ¼ lbs beef chuck roast and a pound of pork fat. The freezing makes it easier to grind. Next I ground them together through the large die grinding attachment on my Kitchenaid mixer. After struggling for about ten minutes and wondering why it wasn’t coming through, I realized I forgot to install the cutters. Brilliant. 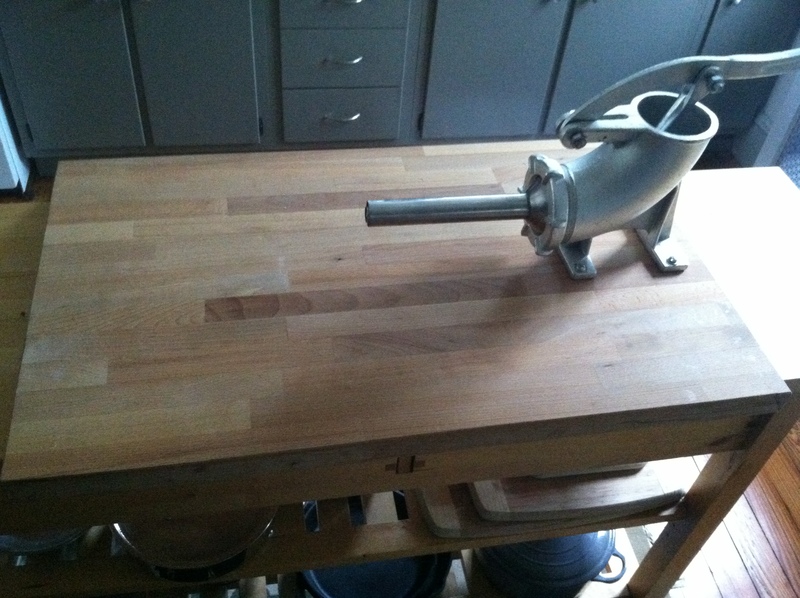 The last time this Kitchen-aid mixer appeared on this blog it was stuffing a pigs stomach. Also, I can’t stand it when PP complains about his camera, but I’m going to have to do the same. I could not get a decent photo. Next the coarse ground meat went into the freezer. The authors stress that everything must be kept cold to achieve a proper emulsion. So I froze everything- the mixing bowl, the mixing paddles, even the grinding cutters and dies. I wasn’t taking any chances. After the meat had frozen a little, I mixed it with salt, sugar, and pink salts. 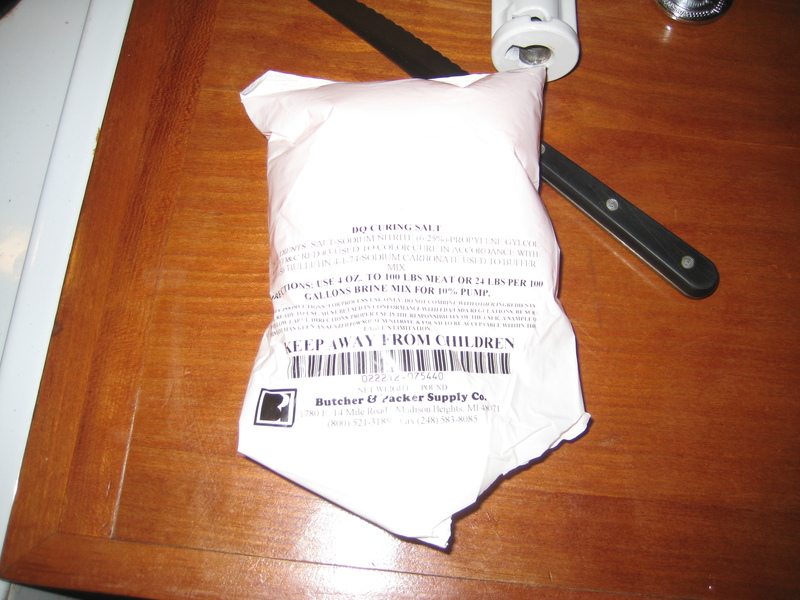 Pink salts are a mixture of regular table salt and nitrite. Nitrites are dangerous to consume in large quantities, so it’s not sold in stores and must be handled appropriately. The mixture is dyed pink so it’s not confused with regular salts. It gives cured meats their pink color, provides flavor, and, most importantly, kills bacteria, especially the kind responsible for botulism. Botulism is bad. I understand why pink salts are required for dry cures, in which the meat is never cooked, but wasn’t sure why this recipe called for it. I’m guessing for color and preservative properties. Whatever, I just do what I’m told. Normally I wouldn’t allow anything with that kind of warning anywhere near my kitchen. 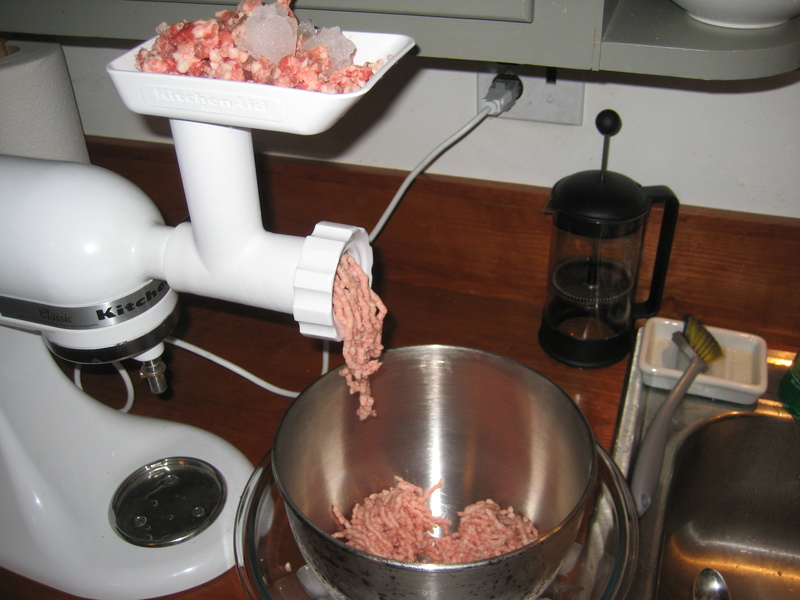 I ground the meat mixture through the fine die along with crushed ice, which seemed bizarre to me. Next I mixed it on high speed with pepper, mustard, and garlic powder for four minutes. Then added some dry milk powder and mixed for another two minutes. Even more appetizing. I swear this could be a video. After the dry milk mixture went in the mix really stiffened up. It stayed like this for several minutes. And into the casings, with difficulty… The casings are natural hog casings packed in salt and need to be rinsed and soaked for several hours before stuffing. I started with my old school sausage stuffer. As I was wrestling this 50 pound contraption up my very narrow basement stairs, shirtless and sweating, I looked up to see my friend Jamie standing at my kitchen door with a look of horror on her face. I quickly donned a shirt and she was gracious enough to let an awkward moment pass. There might have been acoustic Bon Jovi playing really loud on the stereo, too. It worked but it took forever. The mix kept squeezing out of the top of the press. 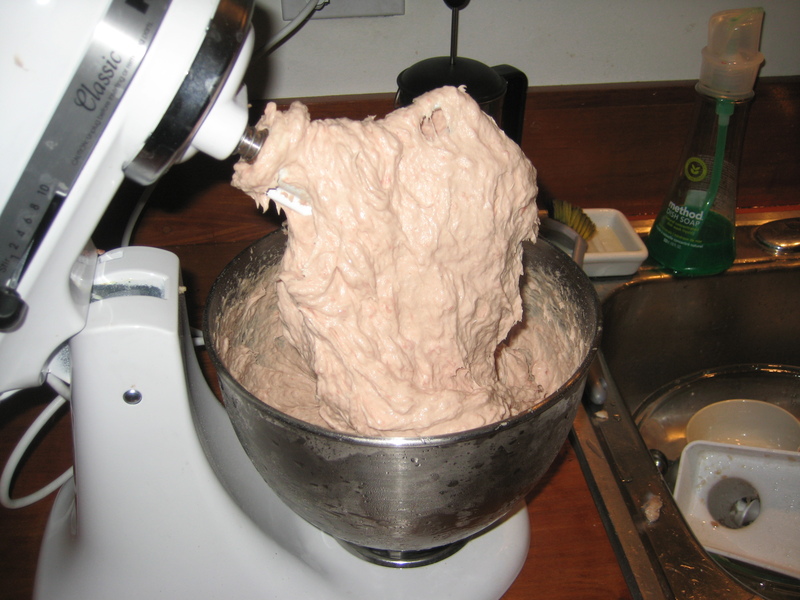 I have the attachment for my mixer but the authors warn that using a machine can break the emulsion and the mixture will “collapse”… whatever that means. After stuffing one link with the manual stuffer, I decided to risk it. So I moved on to the kitchen aid stuffer. That too was a pain. So I stuffed the third link with a simple pastry bag. While the results from the pastry bag weren’t as professional looking, it was by far the easiest method. 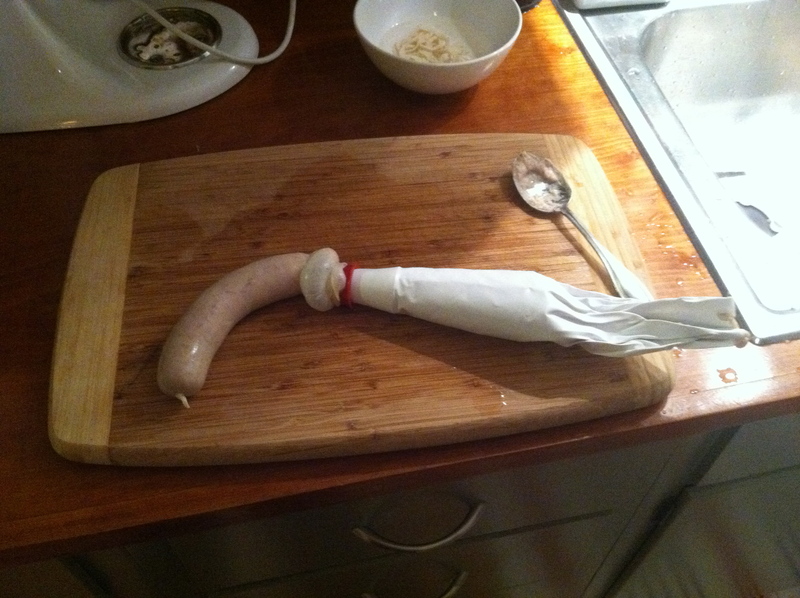 I recommend this method if you’re starting down the emulsified sausage path. 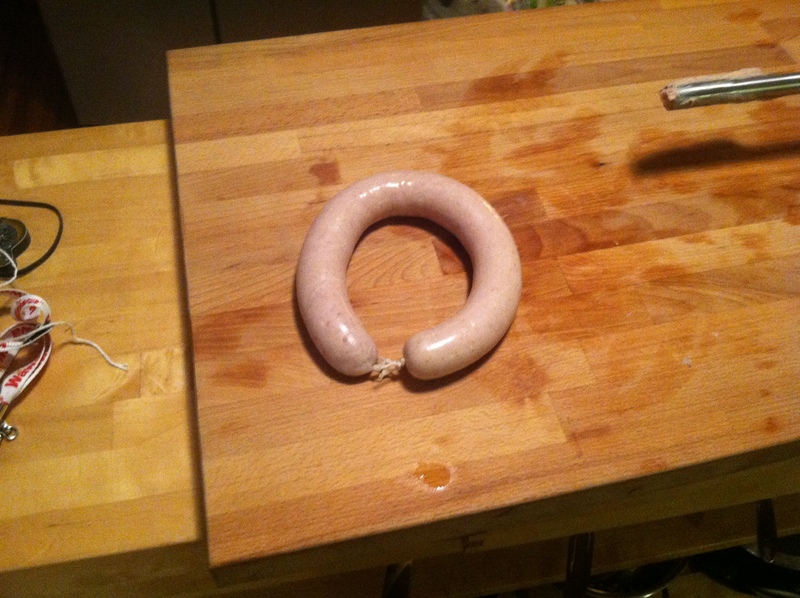 I tied the sausages into rings and put them in the fridge to dry overnight. By the time I finished cleaning up my mess it was morning and time for the smoker. 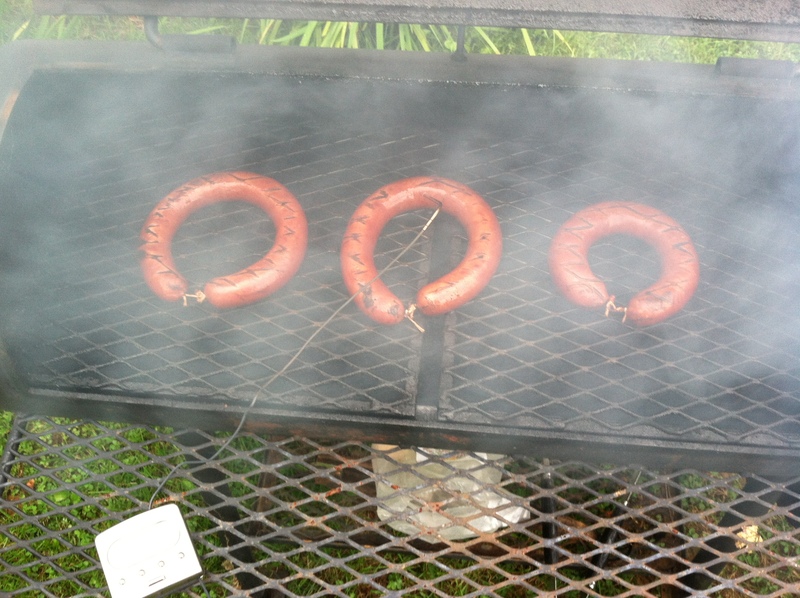 The sausages went on the smoker at 180 degrees for several hours over hickory, mesquite, and apple wood chips. When they reached 150 degrees I dunked them in an ice bath, sealed them individually, and put them in the fridge. Going into the smoker. 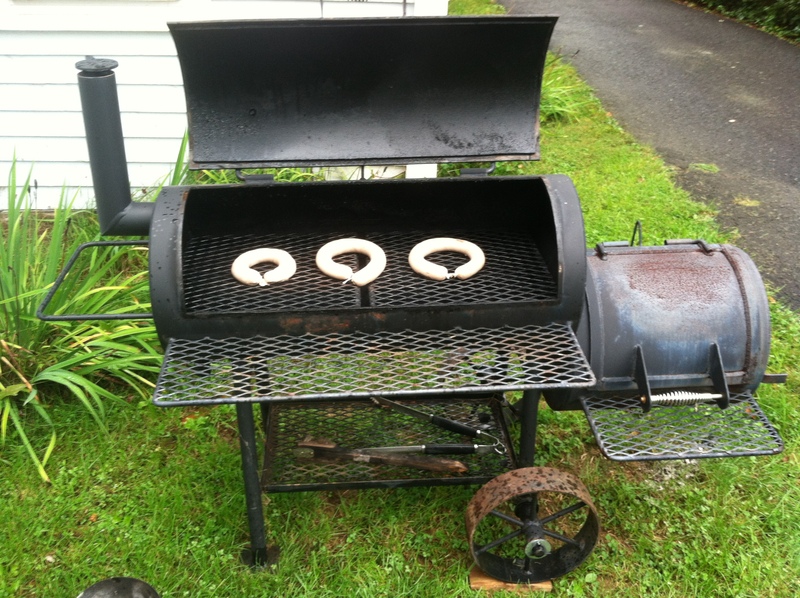 I’ve gotten a lot of mileage out of this Yoder smoker. It weighs about 400 lbs and will last a lifetime. Four hours later. Lookin’ good!! That’s a thermometer cable. I just started using instant read thermometers a couple years ago and have never looked back. An indispensable tool. To serve, I broiled them the way Mom used to, sliced them, and served with Dijon mustard. They were outstanding. Just incredibly delicious, fresh kielbasa, verified by the rate at which it was devoured by friends. Okay, not the best presentation, but that’s not really my forte. Delicious. I’d make it again, but will plan the stuffing part a little better. It was a nightmare. There are a lot more recipes I want to tackle from this book, and hopefully my annoying little brother will ask me back to share them.